I recently spent some time meeting with the people involved in this project. It's well-run and I'm confident that it will get built. I ended up deciding not to buy in because the prices are simply too high: average $586 per square foot up to $611 per square foot for family-sized units (some of which have been bought by well-off retirees, unfortunately). Those are the estimates without the interior plans even being finalized, never mind construction overruns. If you're sure that you're going to spend half your time in the communal space, those prices are reasonable. But my concern was that if it ended up being used as regular condos like Cardiff Place, I would have a mortgage larger than the market value of my unit. Those are crazy prices! Why on earth would someone pay those prices when that is so far above the norm? And here is another question - what would ones exit strategy be? This concept appeals to such a limited marekt how could one expect to easily re sell and even more re sell at at least the rate of inflation over the time one owns it. This seem like some pretty Utopian thinking to me. Thanks for your feedback. At nearly $600 per square foot, what makes you confident that this will get built? I believe there's a sufficient supply (29 units) of people who can afford to spend that much for the potential benefits. $600,000 isn't that much money to some people and it might be the cheapest way to prevent loneliness and the costs of social isolation. For someone who's aging, the community could allow them to save that much money in delaying more expensive care options. If your plan is to be taken out of the place in a coffin, who cares how much it's worth on the market? Edited by Jared, 21 May 2015 - 03:10 PM. Hmm, that's an interesting way to look at it. Well, its still chugging along I guess. They have their next meeting planned for the end of this month. CBC's On The Island recently had a segment with someone from the group but I didn't hear it. I must commend this group for their tenacity. I still think it will be a challenge all the way through. Eight years ago, Bill McKechnie envisioned a co-housing space in an urban setting that would both bring people together and reduce one’s environmental footprint. Now, those dreams are inching closer to becoming a reality in Fernwood. 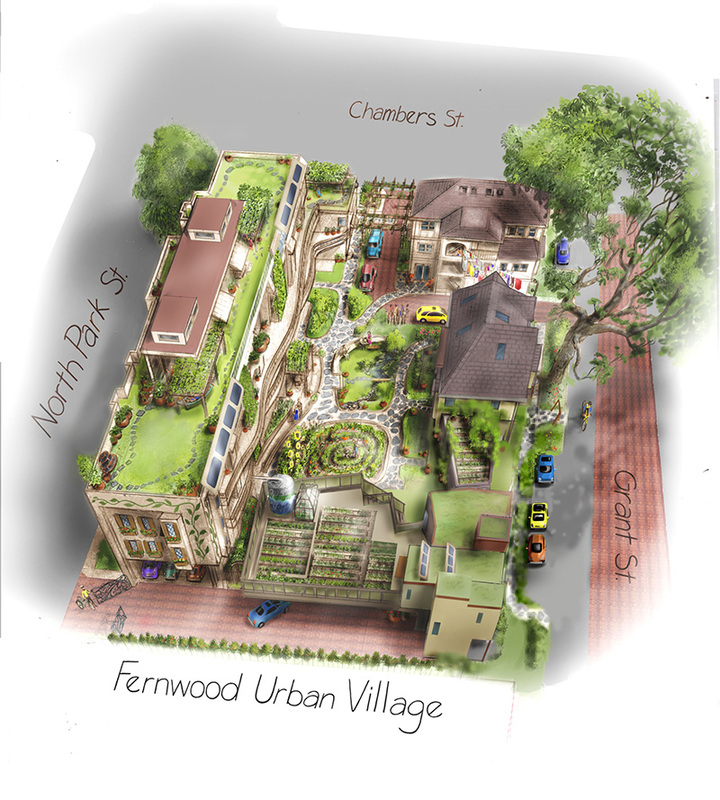 The Fernwood Urban Village is a multi-generational, co-housing community at the corner of Chamber and North Park streets, in which individuals and families share social and physical resources in an urban community setting. The 28,600-square-foot project (roughly two thirds of an acre), will include guest rooms, exercise facilities, a woodworking workshop, commercial kitchen, laundry room and an art space. Currently, McKechnie is in the process of finalizing technical drawings and applying for the building permit. He hopes to begin construction in the fall. Who is backing the Fernwood project financially? In this market, with rising construction rates and the big contractors running at full tilt, is it conceivable that such a project could even get off the ground, unless it is phased over a very long period of time? Years, even? Do you need to phase it in if it's sold out? You cooperatively fund it, with all your purchasers. Just like one family would build one house. Selling out before shovels are in the ground means you're locked in and have no contingency for delays or problems. A one month delay could cost hundreds of thousands if not a million. And until crews are in the ground they don't actually know what issues they'll face. Legato is a good example of surprises during a critical and costly phase. I don't think this is a typical set-price purchase contract with the investors/purchasers. They are going along for part of the ride. They have probably accepted a percentage of the overall cost of building, whatever that ends up being. There is also no underground parking, so surprises at excavation might be limited. All related FUV activities, including the monthly meetings have been suspended. In the event that the project should once again become viable, we will advise you. Thank you for your interest and support to the project. Maybe he's just gonna sell the land! They'll have to sell the land to reimburse the people who bought in. Development costs will be lost, of course. Yeah, it's too bad. The concept had some merit. Apparently Alan Lowe is involved in potential next steps for the development of the property.